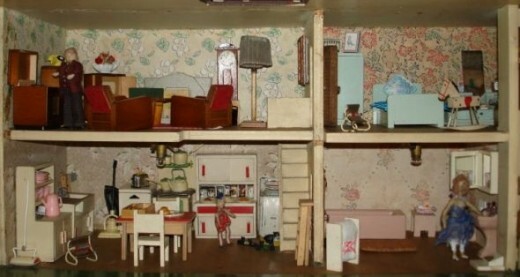 I'd like to share my Vintage Dolls House collection with you! I hope you enjoy my restorations and collection of furniture and dolls. If you'd like to contact me please leave a comment at the bottom of this page. Happy collecting! The first eight of my houses are by Tri-ang - the registered name of Lines Bros Ltd. This firm started around 1919 and went into liquidation in 1971 and although the Dolls House factory was taken over, production ceased in 1972. The majority of my Tri-angs date from the 1950s and 1960s, but I hope one day to add to my collection with some earlier houses, for example the famous one pictured above which was model no 72 between 1932 and 1937 and renumbered as model no 93 in 1937 and produced up until 1958. In International Dolls House News Summer 1989 issue Rosemary Myers uses the phrase "Stockbroker Tudor" to refer to this house and the name "Stockbroker" has become attached to this model. In the same article she discusses the fact that the "Metrolands" of John Betjeman is epitomised by this house. Osbert Lancaster originally devised the term "Stockbrokers' Tudor" in his 1938 publication "Pillar to Post" and was a close friend of John Betjeman, having studied at Oxford together. Osbert Lancaster is my grandfather in law - so maybe I have a claim to a connection with the naming of this house !! The picture below shows 5 of my Tri-angs - it was quite a difficult picture to take to get them all in! 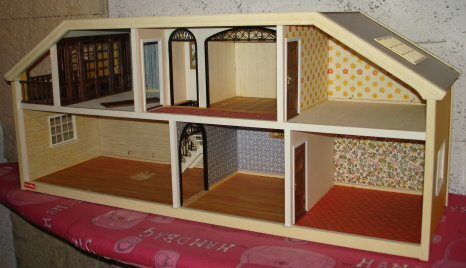 I was fortunate to purchase this beautiful Dolls House at a very reasonable price ! It was produced by Tri-ang and was one of their 1/12th scale models, and available between 1932 and 1936 only. 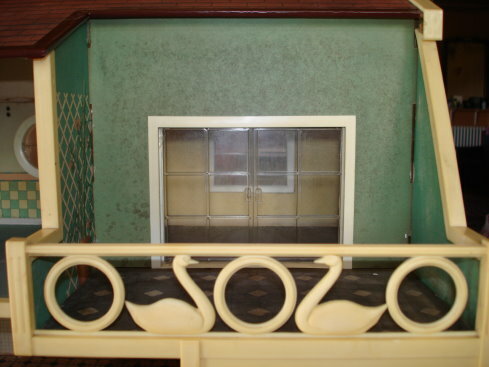 This model, with the sideporch was sold between 1933/34 and 1936 as model No 70. As you can see it is in superb condition and I am "over the moon" with my Mini-Stockbroker! Here it is with replacement wallpapers. Below is the result of my hard and painful work ! I was very lucky to discover the original 1930s wallpaper underneath. I have slowly and painstakingly removed the top papers (and have the blisters to prove it !!). Marion Osborne (a leading Tri-ang specialist) believes that these wallpapers that she has nicknamed "amoeba" were used by Tri-ang between 1934 and 1935. Tri-ang had up to five different colours of these wallpapers! Here it is with the majority of furniture that I am going to display in it, however I haven't yet got around to putting in all the finishing touches and accessories. 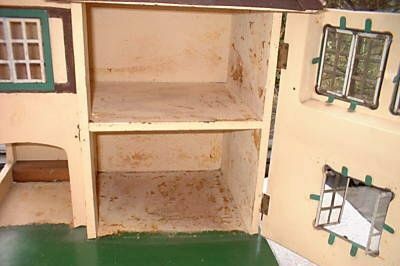 It is still very much "work-in-progress" as I have just finished stripping a non-original coat of paint from the inside of the door and refurbishing the windows. I have already removed a non-original coat of paint from the lower outside front and the Tri-ang flowers are still in tact. The upper front has also had a non-original coat of both cream and blue paint removed, to do this I had to very carefully remove the gables. My next job will be to remove the two coats of non-original cream and blue paint from the sides and back of the house and around the porch area. So there is plenty of work to keep me occupied! The furniture on display here is mainly Barton. 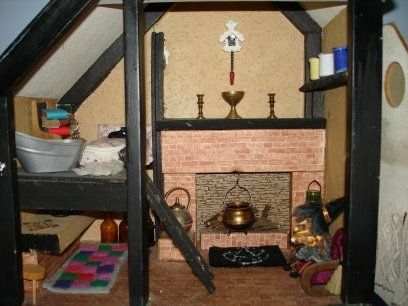 Because this house is 1/12th scale, I am able to include some of my favourite items from the Barton Tudor range, which tend to be slightly larger than 1/16th scale, and so look better in the larger scale dolls houses. Some of this furniture has the "ball and sausage" beading which dates them to the 1950s, in particular the corner cupboard at the back on the right hand side, the cabinet on the left wall opposite the bed, and the Welsh dresser at the front on the left. In addition, the corner cabinet has two separate doors, the later 1970s version has only one door. The cabinet opposite the bed has a card backing. The carver chair at the front on the right is also from at least the 1950s as it has dowling running between its legs. The half-round side table at the back on the left hand side did not appear in the Barton Catalogues after 1966, neither did the dressing table at the front on the right. The four poster bed, although from the same Tudor range probably dates from the 1970s due to the drapes material and the colour of the wood/varnish used. In addition to the Barton furniture there is an old armchair by Pit-a-Pat. 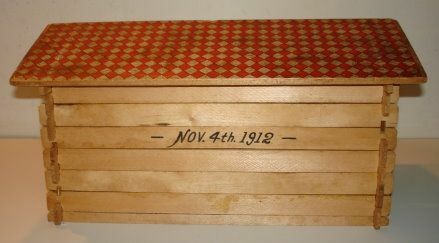 Pit-a-Pat furniture was made by E Lehman & Co of London from 1932 until World War II and is highly sort after. There is a Kleeware mantle clock and a Renwal table and standard lamp. There is a beautifully beaded ceiling lampshade. Handmade accessories include a red crochet rug, beaded candle decoration and handbag. The green cast metal bathroom suite in the door is marked "Fairylite" and this was marketed by Graham Bros of London shortly after World War II. The blue wooden towel rail is by Barton and the blue chair is handmade. The two lovely green fabric armchairs are by Pit-a-Pat and both are stamped on the underneath. On the table is a plate of plaster sandwiches by Kaybot. There is also a Barton bureau with the diamond ink stamp and a hallstand with strip handles, which is dated to the late 1940s. There is also a brown Kleeware standard and table lamp. The rug is handmade, as are the cushions. The dolls living in this house are Grecons. The blue kitchen furniture, the cupboard and the gas cooker in the door are by Barton and carry the diamond ink stamp dating them from between August 1946 and 1948/9. In the door there is an early Barton carpet sweeper. I also have a Taylor & Barrett metal fridge that dates from before WWII. Here is a hanging miniature handmade beaded flower drier and a basket of beaded flowers on an early Barton sink. On the back of the house was a wooden panel that housed the old lighting system. I removed the panel and attached to this panel were the two bulbs that went through to the top and bottom floors. Luckily the modern "vintage looking" wall lights that I had chosen to install fitted perfectly into the holes left by the old bulbs. The two lights are powered by a 9 volt battery (see below to the Amersham for a full description of how to add lighting to a dolls house). After what seemed like months of waiting, my childhood Tri-ang No 40 has finally arrived from England !! I was intrigued to see what state the house was in as I had last seen it about 7 years ago and all I remembered was looking at its red roof in a box as it was packed away into my parents' loft. However it has been taken down and sent, via my kind sister, to France, to be united with other Tri-angs. So I opened the box to find the front in very good condition - so good my first thoughts were that it wasn't my childhood dolls house! There were curtains at the windows, machine sewn and a material front door complete with number - surely this wasn't my work? I immediately recognised the pink & silver wallpaper upstairs, I had covered my school exercise books in similar ! So it was my dolls house after all - phew ! I carefully unpacked all the furniture that my parents had saved and stored and it looks like this - all original Barton, including people! Welcome to the family, Tri-ang No. 40! Now my Tri-ang No 40 has been re-wallpapered and the Twigg furniture moved in from the Conway Valley house, as I felt the scale is better suited here. I have added the partition, but it is not permanent and could easily be removed to make the house into just the two rooms upstairs and downstairs. The wallpaper in the bedroom is a golden shaded diamond shape, whilst in the bathroom it is a pink shade. Some of the Twigg furniture looks a little oversized, but I love the design. I thought I only had one blue kitchen chair and three red dining room chairs. However, on closer inspection one of the dining room chairs was originally blue and I carefully stripped off the red paint - I can't tell you how pleased I was with my discovery! All the house needs now is an inhabitant - the search begins! This is a Tri-ang No 65 and the transfers on the metal sliding front date it to the late 1960s. It is in quite good condition considering its age, its roof is slightly cracked and there are small bits of paint missing from the front. The stairs are present but the door is a replacement, the original red plastic one has been lost over the years. You can see from the picture that the lights are still working ! 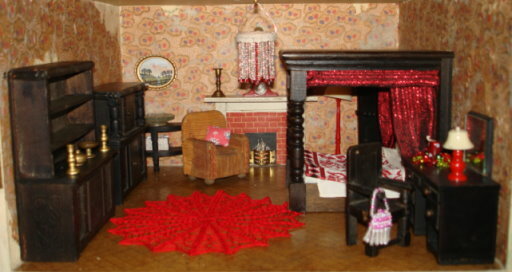 It is furnished with Barton furniture dating from 1940s to 1970s and the dolls were sold by Bartons in the 1960s and 1970s. The bedroom on the left is furnished with a pink set made by Barton in the 1950s. The mirror is a replacement, the old one having been misplaced over the years. The bedcover I made myself and the picture is a copy of a Marc Chagall. I think it's a lovely setting for a little girl's room. The bathroom is a yellow and green plaster set produced by Barton up to 1964, after this date their sets were made of plastic. There is also a wooden clothes airer. The plastic laundry basket is by Reliable of Canada. The print on the wall is by William Morris. The right hand bedroom has some of my favourite early Barton furniture. The dark wooden wardrobe, chest of drawers and dressing table all have large handles and the bed has brass feet at the bottom. The living room has 1960s and 1970s Barton furniture. There is an unusual television and the famous "Bear" rug ! The family are relaxing ! The hallway has some 1950s Barton furniture and an ancestoral photo of mine is over the dining table. There is a beaded miniature centre-piece on the dining table and a handmade beaded mirror on the wall. The kitchen is full of 1970s Barton items and is detailed below in a "zoom". Mother is busy in the kitchen putting the finishing touches to a birthday cake. She is proud to have the full range of 1970s Barton kitchen units, with the white & red plastic doors and handles. The kitchen table has a red top and this one was produced for a couple of years in the 1960s. My next house is a Tri-ang No 50, and this one is late 1950s to early 1960s as it has a hinged metal front and no transfers. The transfers were introduced around 1963. It also still has the flower pots outside the front door, which is a rare find. It is not in too bad condition, a little bit rusty, but very clean and tidy inside. It is furnished with mainly Dol-toi furniture, mostly from the 1950s and 1960s. The bedroom has Dol-toi furniture from the 1950s and 1960s, including a four poster bed. The wallpaper is of a William Morris floral style. There are miniature accessories of a parasol and perfume bottles on the dressing table. The ceiling lampshade is handmade and beaded. The bathroom is a "primrose" yellow set by Dol-toi from the 1960s, including a towel rail and radiator. On top of the cabinet in the corner is an early Dol-toi clock from the 1940s or 1950s. The living room is Dol-toi furniture from the 1950s and 1960s, see below for a "zoom". Finally, the kitchen is Dol-toi from the 1960s, characterised by the "pin" handles on the units. There is also a fire by F G Taylor & Sons. On the wall above the sink is a Spot-On Ascot water heater, which is a rare find and in excellent condition. The dolls that live in this house are Grecons. The living room is furnished with Dol-toi furniture from the 1950s and 1960s. The dining table and chairs are from the Dol-toi Contemporary Range, along with the matching sideboard. Next to the 1960s plaster Gas Heater fireplace there is a bookcase filled with Dol-toi books with a radio on top. On the other side of the fireplace there is another cabinet also from the 1960s. There are two red armchairs with bamboo arms, possibly from the 1950s. The bear rug is also Dol-toi. There is a lovely pink metal Dol-toi coffee set on the sideboard and a handmade miniature beaded flower basket. On the dining table is another handmade miniature beaded tablemat. I love the flying ducks above the fireplace, if you like them too they can be ordered from Celia at KT Miniatures (see the link below). This is a really lovely house and probably my favourite! It is in excellent condition, it has all its original wallpaper and windows, just missing one curtain. It has both chimney pots and its front steps! It is furnished with Barton furniture from the 1950s through to the 1960s. Like the other 1950s Tri-ang houses, this has a "hidden" section above the garage, and whilst it is tempting to put the bathroom here, I decided to move the rooms around and have the bathroom downstairs next to the kitchen. I had collected some nice items for the Bathroom, and didn't want them hidden away! The kitchen has some lovely furniture including an early wooden fridge by Barton. There is a metal stove and washing machine by Barrett & Sons and a family of cats tucked under the stairs. The upstairs living room is furnished with Barton furniture from the 1950s, including a Radiogram and Console Television. There is also an unusual Grandfather clock and ebay finds of a wooden painted firescreen, metal coal scuttle and a wooden standard lamp. The bedroom is furnished with 1950s Barton furniture and the set is in pale green. I made the bedspread myself and you'll see that Mama Grecon has a bit of a shoe fetish ! Miss Grecon has a Barton wooden rocking horse! I really like the Bathroom in this house as it has some lovely items. In here there is a nice pink Barton plaster bathroom suite (pre 1964), including the wooden toilet roll holder and towel rail (so easily lost!). The cabinet above the sink and the set of scales on the floor are by Twigg. The fire in bathroom is by F G Taylor & Sons. The pink plastic laundry basket in the corner is by Renwal of America. A beaded basket and some perfume bottles are lovely miniature accessories! This is a smaller version of the house above. It is a strange house in that it has one large room on the top floor that has space over the sunporch and the garage for furniture, but it is difficult to see the furniture placed there! There is a nice 2CV van (1/17th scale) parked in the garage! This house is in very good condition. The previous owner had put some stickers on the walls as a child but I have managed to hide these behind furniture so as to retain the original wallpapers. I have replaced the brick paper in the sunporch. This Tri-ang is furnished again with mainly Barton furniture from the 1950s and 1960s. In the kitchen there is a carpet sweeper made by Mr Ley for Barton and a small F G Taylor & Sons stove. In the upstairs living room there is a Romside metal fire with a wooden Barton fire surround. This Tri-ang is inhabited by Dol-toi dolls. Here we find Grandpa Dol-toi relaxing, reading his newspaper and listening to the radio. This sunporch area is an interesting feature of these Tri-ang houses and I am lucky to have the original back bench with mine, as these easily get misplaced. This is the smallest of my trilogy of wooden 1950s Tri-angs. When I found this one it had been stripped of all wall and floor papers, so in a way it was a blank canvas for restoration. The roof had been repapered before I owned it. I replaced the bottom floor kitchen window with one from a Tri-ang A/BE/CEX, which was originally blue. The window frame was painted green with metal car paint to blend in with the other windows. This is how it looked when it arrived - bare! I have repapered it, although the wallpapers are not vintage, I feel they are fitting to the house. 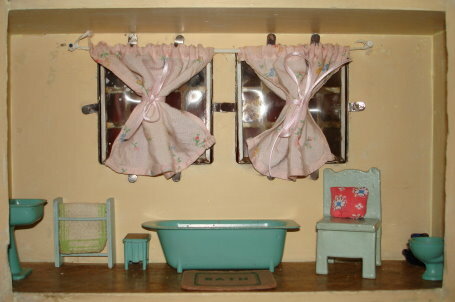 It is furnished with Dol-toi furniture from the 1950s and 1960s and the family of dolls in this house are Dol-toi too. Some of the furniture has the "Stamford" Dol-toi stickers on, dating it to the 1950s. Upstairs there is a pretty little crib and cot bed with a lovely pink wooden fireplace with Kleeware mantle clock. Above the sunporch is a pink wooden bathroom. Downstairs is a 1950s Dol-toi kitchen with metal tea and coffee sets and a rare wooden vacuum cleaner. There are a set of metal Dol-toi saucepans too. The mangle is by Barton. This Amersham was looking in a sad state when I discovered it. The wallpaper had been partially stripped downstairs and it had lost its garage from the side. The previous owner had wanted to do it up but hadn't found the time. However I hoped I could have a go at restoring it to its former glory. I was lucky enough to be able to retain the original wallpapers upstairs and just repaper downstairs. There was originally a wooden staircase on the right hand side of the living room, but the stairs had also been misplaced over the years. This left a hole in the ceiling of the living room/floor of the bedroom. My husband kindly helped me fit a piece of wood into the gap. The floor has been papered in the bedroom so the repair is not seen and the ceiling of the living room has been painted and hides the repair quite well. The furniture is Dol-toi from the 1940s and 1950s. The bathroom suite is green & gold, and there is an early Dol-toi green heater. The bedroom is a pretty yellow and blue set from the 1940s. I have accessorised the bedroom with a beaded parasol and handbag and there is a copy of a Gustav Klimt painting on the wall. The kitchen is furnished with early Dol-toi pieces including a nice pink tea set. The cooker and sink are from the 1940s. There is also a rare boiler and a mixer & bowl made from plaster. The vacuum cleaner is Barrett & Sons, which was an ebay bargain without its handle and this has been reconstructed from a lollypop stick ! The living room has a radiogram, dining table and chairs, grandfather clock and coffee table from the 1950s. On the dining table there is a Dol-toi port & glass set that is quite rare to have survived this long! The dolls are Grecon and they have a pet Scottie dog, who is lead and marked "Made in England" but I am not certain of the maker. This bedroom is furnished with some lovely early painted Dol-toi furniture. The wardrobe, dressing table, stool and bed all bear the stamp "This is a Dol-toi product" which dates them to around the 1940s, before the firm went on to use stickers on their furniture. You can see that the dressing table has a curve to its sides, the later models had angled sides. The dressing table still has its glass shelf below the original mirror too. I really like the dol-toi bear rug, it has all its eyes and whiskers present! The blue wooden fireplace is an early Dol-toi "Art Deco" style. I have only seen one other of these and neither mine nor the other had a grate in it, however I have chosen to add a grate from a broken 1950s fireplace. On top of the fireplace is an early Dol-toi clock. Here is the sign above the front door, this dates the house to the early 1950s. The pillars by the front door would originally have been white with the flower pattern, but there was so little of the original paint left I decided to strip it back and repaint it in green to match the window sills. The rest of the cream paint I have decided to retain. It is original to the house. The windows are called "half-lights" because they can open at the top as well. I was very lucky to have all the windows when I bought the house, as they are quite hard to come by. I also have the original door knocker too! I have repainted the inside of the doors and I have added new curtains to the windows. 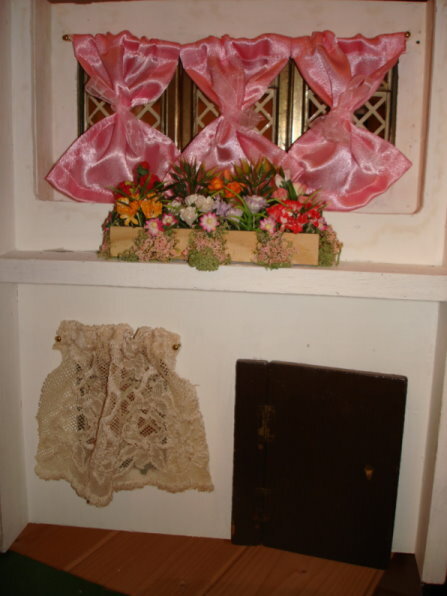 The lace is modern, but dyed with cold tea to obtain an aged effect. The pink curtains I made after getting an idea from a friend's Tri-ang Stockbroker (thank you Wendy). At the side of the house is the space that would have originally been the garage. 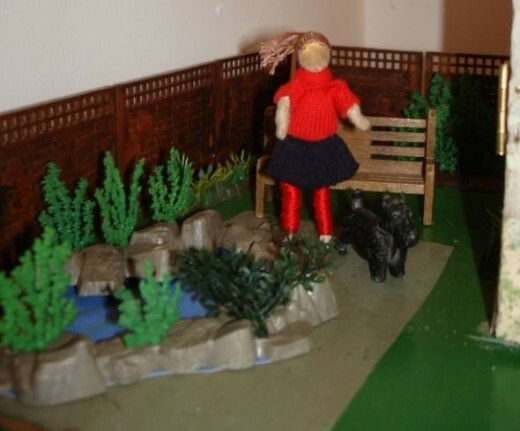 I have created a garden area with some plastic Britains Flower Garden plants and a pond. There is Dol-toi bench and here is Ms Grecon playing with the Scottie Dog whilst visiting her Grandparents. Lighting in "The White House"
I have added some contemporary lighting to the Amersham. When I first got the house I noticed that it had small holes drilled in the back, but there was no other evidence of lighting. I have added ceiling lights in the bedroom and living room and a wall light in the bathroom. I have powered the three lights by a 9 volt battery. With the holes already drilled in the house, most of the hard work had been done for me ! All I had to do was to remove the plugs from the lights and thread the wires through the holes in the back of the house, replace the plugs and fix up the lights where I wanted them. As this has proved a successful exercise, I plan to add lighting to a couple of my other houses shortly. 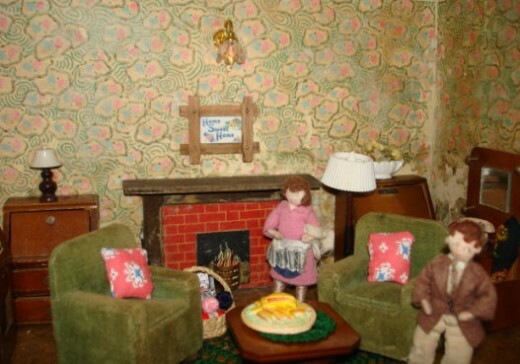 In 1975 Barton launched the Caroline's Home Dolls House and matching range of furniture and dolls. This proved very popular and was quite distinctive with the yellow shutters and front door. 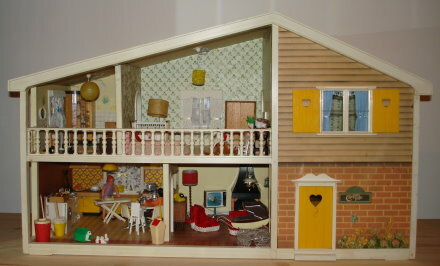 When Barton was bought out by Lundby this style of house initially remained on the market but the colours were altered and the name was changed to The Dream House. 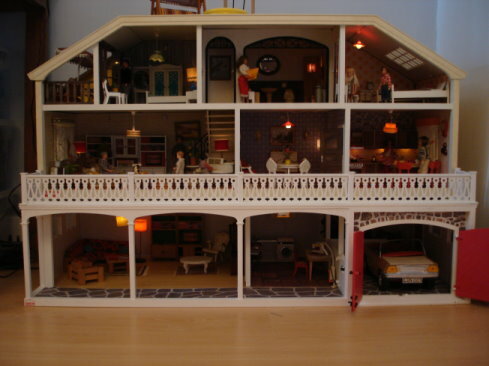 This house was a French ebay find, and it was my first Dolls House, very important as it was the start of my collection ! 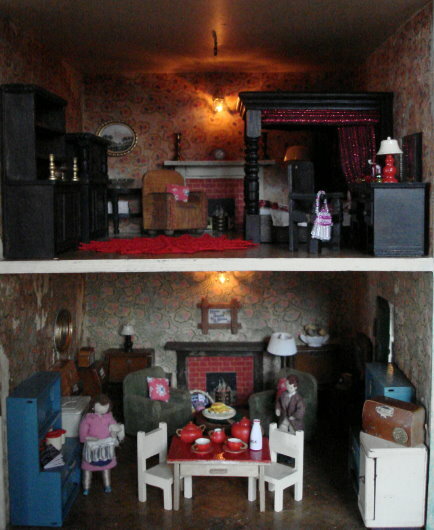 The house is furnished with Barton for Caroline's Home furniture, mainly from the 1970s Catalogues and the dolls are those sold by Bartons in the 1970s. 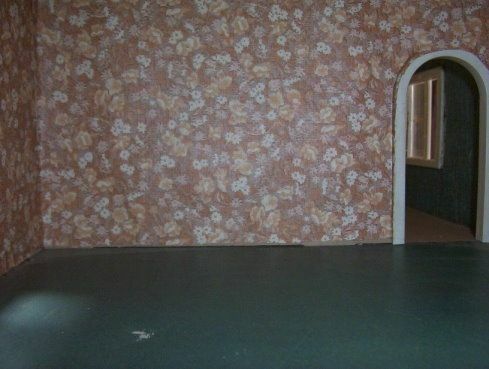 Here is a picture of the end bedroom, wallpapered by the previous owner. Behind this wallpaper lay the famous "Chicken & Horse" mural. I painstakingly removed it and the end result is not too bad! In the early 1980s Barton added to their popular Caroline's Home range with the larger Caroline's Home Super Deluxe. This house has access from the left hand side and the front. It has a front and back door, 2 sets of sliding patio doors, a balcony and a working garage door and ramp. This house was a Wedding Present ! It is in very good condition, still having all its patio & garage doors. 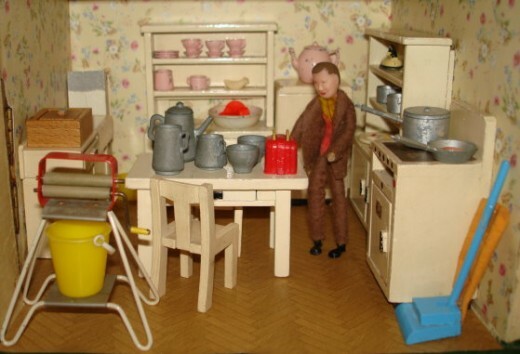 It is furnished with Caroline's Home furniture and a few Lundby items as Lundby tookover Barton in 1984. The dolls are those sold by Caroline's Home in the 1980s. This is the balcony area above the kitchen. This house has the nickname among Dolls House collectors as "The Swan House" because of the detailing here and also on the interior door frames. The balcony is a nice feature of the Super Deluxe and the patio doors slide open, allowing access to the room behind, which I have since furnished as a Nursery. The Claremont Chalet was produced by Barton in the early 1980s. 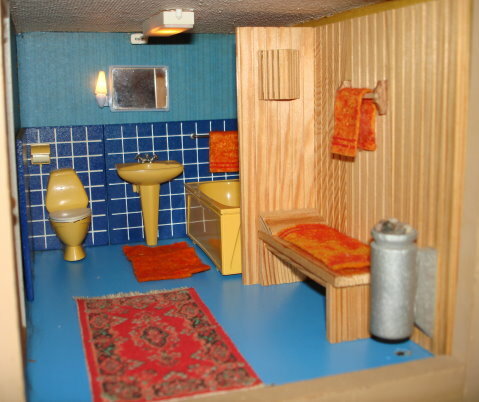 It was the smallest of their Dolls Houses, although an extension could be added to it. 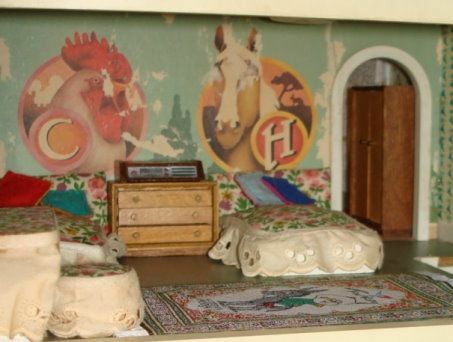 This Dolls House has no windows and is easily accessible from the front. Here is my recently acquired Claremont Chalet by Barton, a French ebay find. It is furnished with 1980s items made by Barton for Carolines Home. In the kitchen are the rarer red plastic units with "glass" doors and the orange saucepans and food items were produced in the 1980s. In the living room there is a fireplace with a "brass" hood and one of the rare Barton parrots on a stand. The grandfather clock is the later one with the stencilling. This delightful little chalet houses the Grandparent dolls that were sold by Caroline's Home in the 1980s. This is a small space upstairs on the left leading out from the bedroom and with stairs up from the living room. Here are two garden chairs and a table produced by Barton. Lundby of Sweden was established after World War II by Axel and Grete Thomsen in Gothenburg, officially 1947 was chosen as the year the company started. At first furniture was produced at their home but in 1948 the company moved to Lerum. 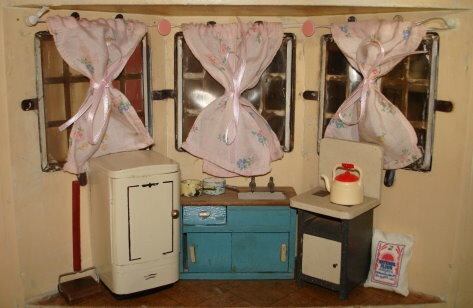 Business flourished through the 1950s and products increased to include a dolls house. The name Lundby spread throughout the World and by the 1970s it was a household name. However in the late 1970s the availability of cheaper electronic toys from the Far East meant that the business began to suffer. Lundby went bankrupt in 1983 and started up again in 1984 with help from the Swedish Government. During the 1980s Lundby expanded by acquiring Barton from England, Lisa of Denmark and Plasty from Germany. 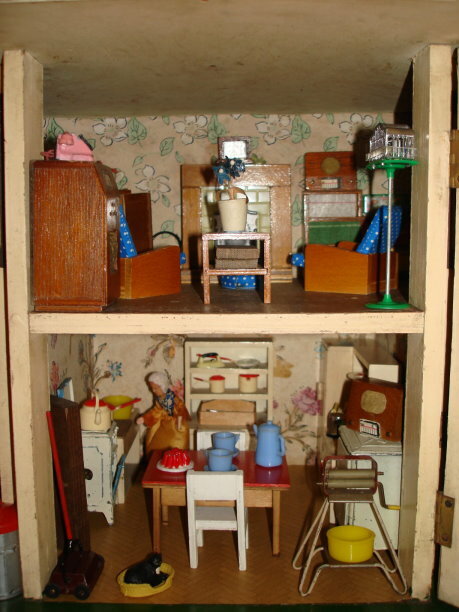 New dolls houses and furniture were introduced to the range during the 1980s. In 1993 Lundby was bought by the ScanBox Danmark Group, who owned the Brio Corporation. 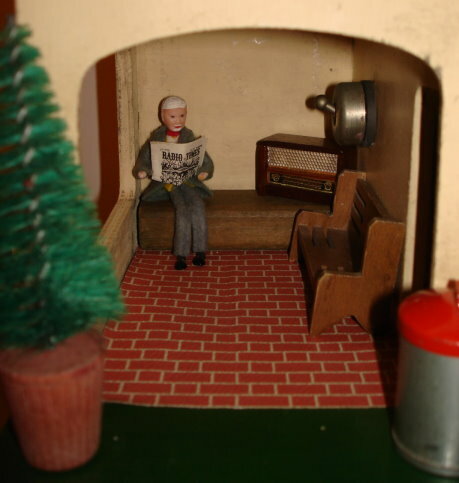 In 1997 Micki Leksaker A/B purchased the rights to produce Lundby. 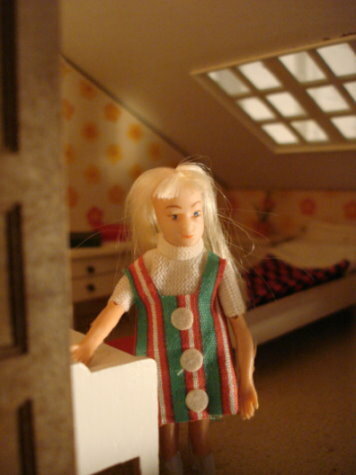 In 2005 there was the release of the first Lundby dolls house in over 15 years with the "2005 Stockholm." 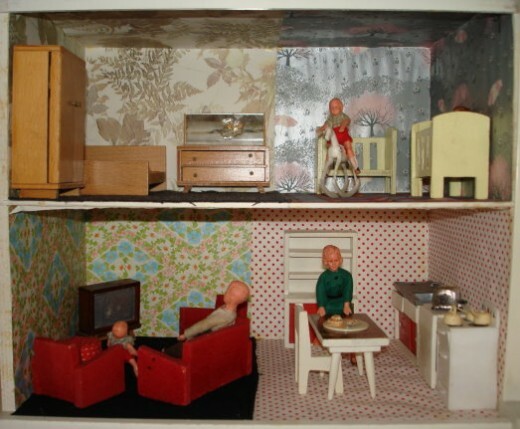 In 2006 the firm kept the original 1960s asymmetrical design of the Gothenburg dollhouse, but renamed it the SmÃ¥land. 2008 has seen the launch of the Gotland summer house. 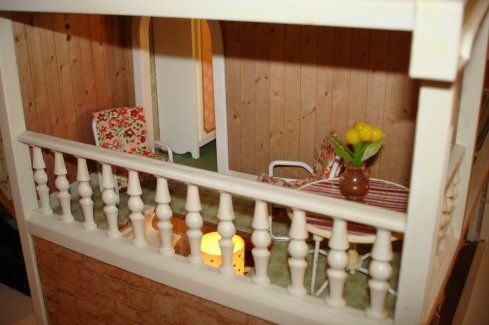 Lundby dolls houses and furniture are 1/18th scale. Originally I had decided not to collect a lot of Lundby items. However recently I had come across a couple of blogs and websites that detailed the earlier Lundby houses and furniture. I then changed my mind when I saw an unloved house on French ebay that was very cheap. I did some investigating and worked out that it was an early 1970s one and after discovering the old Lundby catalogues decided that I did really like the vintage furniture ! So a bid was placed, the auction won and my first Lundby Dolls House arrived! Gosh it was dirty !! I must have used about 30 baby wipes on the floors and roof and nail-varnish remover on the plastic bits of the stairs to get it clean. It also had a small problem on the right hand side where the floor had separated from the wall. This may have happened during its trip across France as it wasn't very well packaged ! Anyway my husband was called to help and after a couple of hours with the wood glue and some wooden spoons as braces, the house was back in one piece and looking presentable ! This house is known as the "Gothenburg" although it did not gain this name until around 1990. It was originally called the Lundby Dolls House or Popular Dolls House and the asymetrical roofline was introduced around 1961. This house is a bit of an oddity as it seems to span a number of years ! 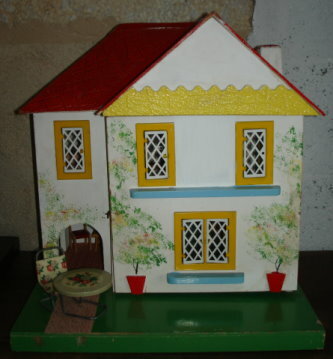 Elisabeth Lantz (see the Swedish Dolls Houses link below) believes that this house is from 1973 and produced in Germany, possibly from the factory at Hohenwestedt (which produced Lundby items for the French-speaking countries). It has the later plastic staircase that was first shown in the 1974 Lundby Catalogues. 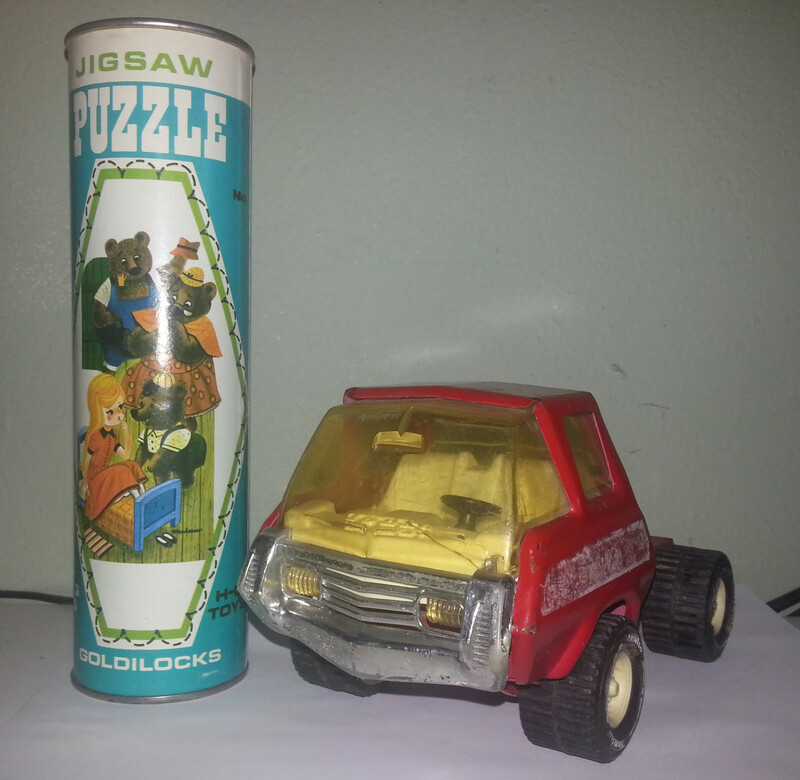 It has the blocks on the bottom for the optional "legs" to screw into, and these were discontinued in 1973. Also it has wooden window sills and no window frames or glazing and this is a pre-1973 feature. It has white brick paper on the sides and has a wooden, not plastic surround, all consistent with having been produced in 1973. However, I have found another Swedish website that labels it as available for purchase as early as 1972. 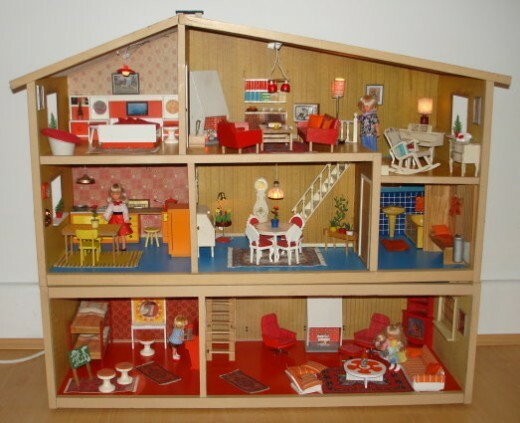 It is furnished with Lundby furniture featuring in the 1972 Catalogues or earlier. The dolls on display in this house were produced by ARI of ThÃ¼ringen, Germany. Lundby first started to sell the lower extension floor in 1972, along with a garden area and swimming pool. My extension floor was manufactured in Germany between 1972 and 1974 only, as it matches the wood of the main house perfectly. This house lives in my bedroom and every morning brings a smile to my face when I wake up! Here is the bathroom with the rare Sauna and all towels, so easily misplaced ! There is also a nice mirror with light attached to it that was available in the early 1970s. 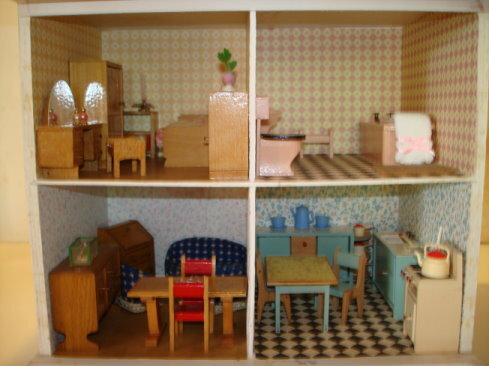 When I first started collecting Dolls Houses I really wanted a Stockholm by Lundby. However they appear to be quite expensive and rare in France, although readily available and cheaper in England! This was my Christmas present for 2008! The house is in very good condition and it still has its yellow front cover. There are a couple of marks on the floor and it is missing its front door handle, but all windows are present and the lighting works! This is the second version of the Stockholm, shown in the Lundby Catalogues between 1978 and 1983. 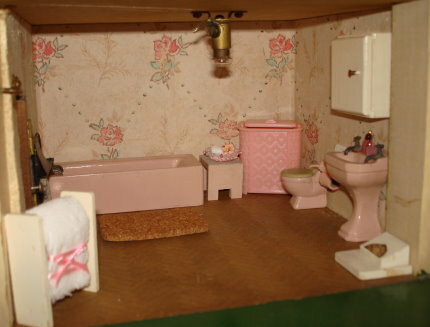 Lundby first showcased this house in the 1975 Catalogue and it was available for sale from 1976 onwards, but the earlier houses have different wallpaper in the bathroom and right hand bedroom. In 1984 the railings and decorative detailing around the stairs, bathroom & living room changed from brown to white. This is a useful tip for helping to date your Stockholm! Again the name "Stockholm" was assigned to this model around 1990. In the earlier Catalogues this house was referred to as "The Super Lundby Dolls House", "Lundby Luxury Villa" or the "Deluxe Dolls House". The chimney was loose when the house arrived, so I stuck it on the roof in the position where it had come from, judging from the glue marks and missing paper. However, when looking at the house in the Catalogues it appears my chimney is in a different place. Perhaps the original chimneys weren't stuck on, which might explain why so many go missing! 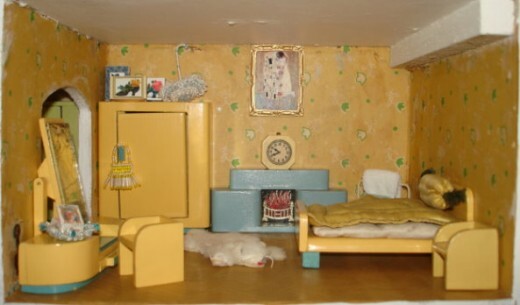 The furniture in the Stockholm appears in the Lundby Catalogues from 1979 and earlier, including the "Blue Heaven" bedroom suite and a Sauna in the bathroom. 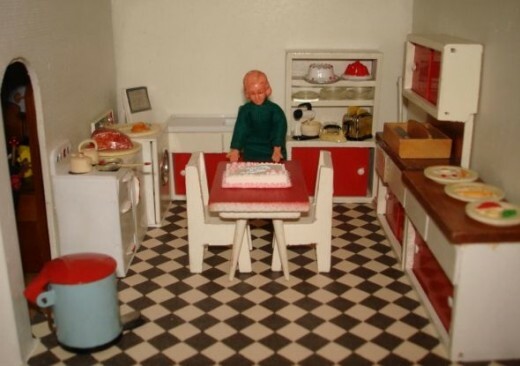 In 1979 Lundby started production of a lower extension floor with additional rooms, a stable and garage area. This is the "Continental II" range of kitchen units that was first introduced in the 1974 Catalogue. The table has a real Formica pattern called "Virrvar" (which translates as chaos), the design of which was "borrowed" from Sigvard Bernadotte in the late 1950s. The kitchen units are designed for under cupboard lighting. 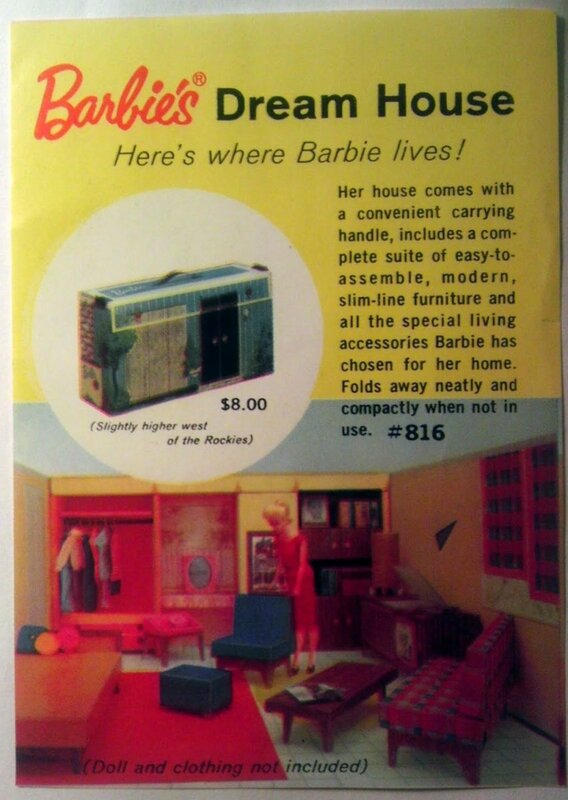 Lundby did not introduce Dolls for their house until the 1974 catalogue. The mother and daughter dolls had "real" blonde hair whilst the father and son had black molded hair. 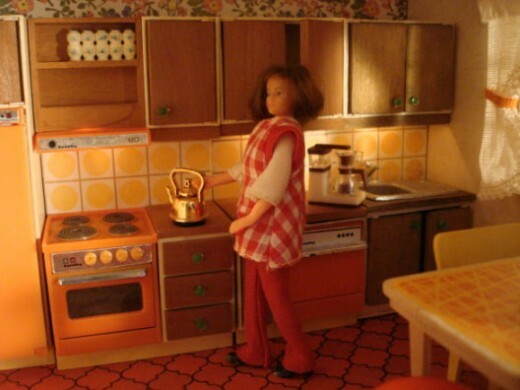 Lundby changed to darker hair dolls and different molds in the late 1970s. 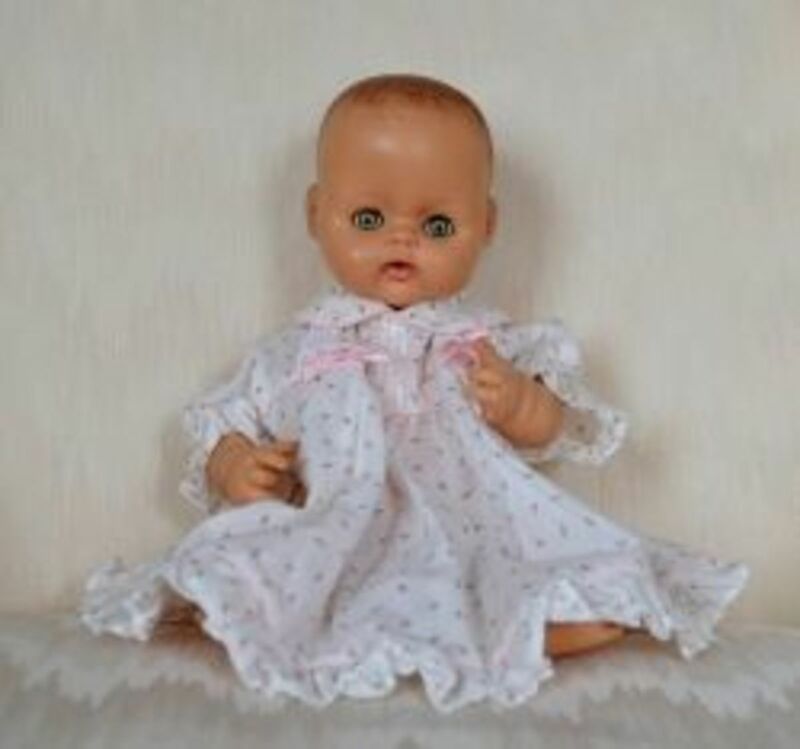 Here is one of the earlier daughter dolls called "Marie", available to buy between 1975 and 1977. 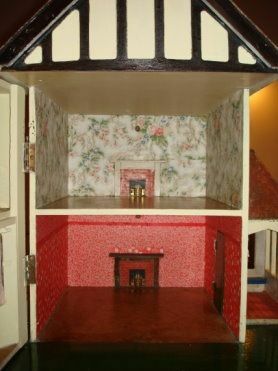 Here is a rare Dolls House made by Conway Valley. 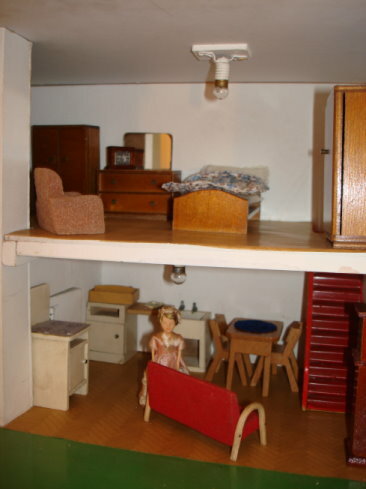 Conway Valley are one of the less well known makers of British dolls' houses. An advertisement in a 1950 issue of "Games and Toys" found by Marion Osborne states that "BS Bacon (Games) Ltd of Besbac Works, Llanrwst, North Wales were wholesalers and manufacturers and they were selling the Conway Valley Series." The house probably dates from the late 1950s or early 1960s. The company used Romside metal windows. Whilst this is helpful as it helps distinguish the houses from those produced by Amersham or Tri-ang, the Conway Valley houses are sometimes confused with Hobbies, GeeBee or Penine Products, who all used Romside windows. Many thanks to Marion, who identified it for me. So having decided that I really wanted to show all my Twigg furniture and display it in the Tri-ang No 40, I found the perfect solution for the rather "smaller scale" Conway Valley. I had collected some Barton Small Scale furniture, actually by accident as it came in with a lot of other vintage furniture, so I thought that it would be perfect to display it here. Barton only produced their Small Scale furniture for the Bedroom and Dining Room and so far I have only managed to collect the Bedroom furniture, as shown on the top floor. The beige chair upstairs is by Dol-toi, who also have differing scales to their furniture (some of their 1/16th scale is tiny ! ), so I feel it fits in quite well here. On the ground floor the kitchen is by Barton, but I've picked out the smaller sink, fridge and cooker to use here. The dining room table and chairs is from the Contemporary range by Dol-toi and the sofa and the grandfather clock were also manufactured by Dol-toi. The little doll who lives here called Annie, who I was advised was made by Airfix, is very pleased with her new furniture, and no longer feels drawfed by those bigger Twigg pieces! This house is the smaller scale 1/24 size and I am saving this for my daughter Molly to play with when she's older. The furniture is all plastic so perfect for little fingers ! Blue Box was founded in 1952 by Mr Peter Chan Pui, who established factories in Hong Kong and Singapore. In the 1980s production moved to China. The company is still trading today. 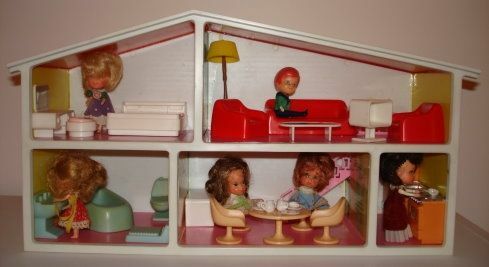 The dolls in this house are by Mattel. This is possibly the earliest house in my collection, or certainly parts of it. The cottage is constructed of a light wood, possibly pine, and builds up from a kit form by slotting the parts together, very similar to a jigsaw. Once constucted it is quite sturdy. The scale of the cottage is around 1/24th, so I will be furnishing it with smaller scale pieces. 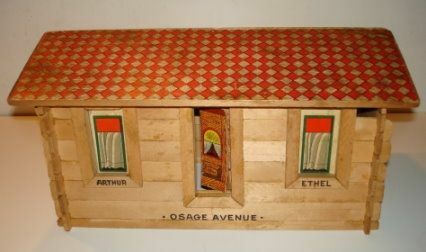 You can see above that inscribed on the back is the date "4th November 1912" and below, on the front are the names "Arthur" and "Ethel" and the address "4926 Osage Avenue". 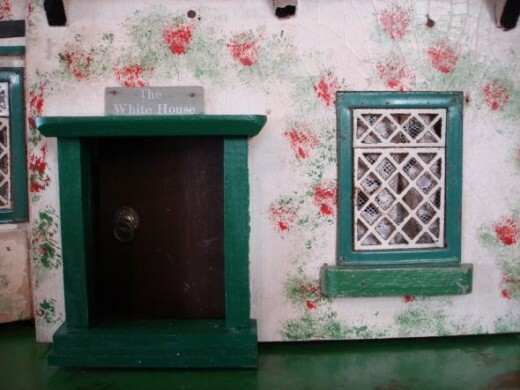 The door shows the signature of R Bliss, however I haven't been able to identify this style of dolls house with other Bliss houses, so it is likely that just the door, front windows and roof have survived from an early Bliss house and have been used in the construction of this small cottage. Here is a view of inside the Cottage from above. The two blue metal beds are by MÃ¤rklin of Germany and have embossed cherubs on both the head and footboards. 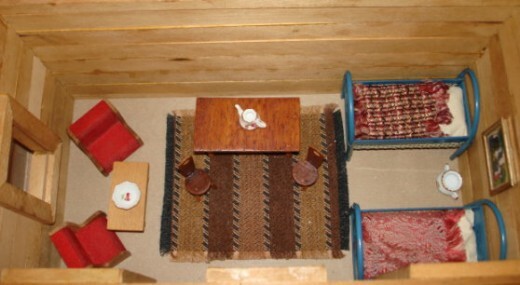 The rug is handmade as are the table and the two little spinning chairs in the centre. The small red armchairs and table on the left are by Dol-toi. The last house in my collection is not really a vintage Dolls House. This super cottage I fell in love with at first sight and it houses a little witch called Morag. I don't know much about its history, the previous owner told me that it was made a long time ago and it is definitely handmade. There are some great little items in this cottage - Morag has a broomstick (of course ! ), spell books, potion bottles and a familiar sitting on her bed! She has a tin bath and some shabby chic furniture in her bedroom. A lovely little home! If you like the flying ducks in my Tri-angs No 50 and 65, Celia has lots of lovely vintage dolls house accessories and also sells vintage houses. There is also a "Galleries" section. Free, non-profit making website which includes a quarterly online magazine. 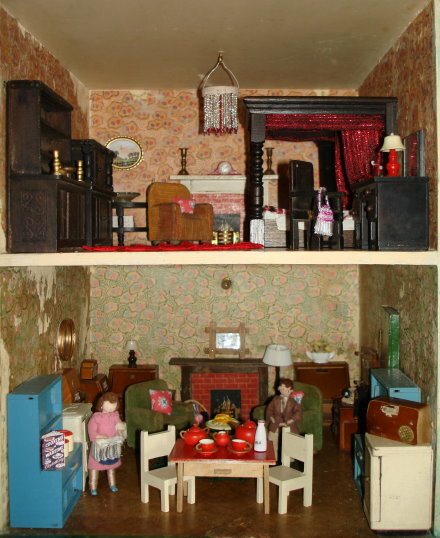 The magazine includes articles/features on dolls houses, dolls house miniatures and dolls. Mainly focusing on vintage dolls houses and miniatures. Here is a link to a website set up by Elisabeth - mainly Lundby but there are other brands and some brilliant photos. Here is a website set up by Nicola just about Caroline's Home made by Barton. Great history and pictures and an absolute "must" if you own a Caroline's Home. This website is all about Lundby, with advice on how to identify and date your Lundby house and furniture. There are also some useful tips on buying furniture on ebay. Sorry but I cannot give valuations on dolls houses and furniture. Please also note that the photos are my own work and they are not to be reproduced or copied. Please do not contact me with requests for inclusions on other websites or magazines. I live in England and yesterday at a car boot sale my husband purchased a dolls house for me, I’ve been wanting one for a while now so you can imagine my delight at finding one at last! hi Sarah I was just looking at your site and I have a triang stockbroker which I am about to sell.it was in a toy museum for many years and is in very good condition. I just wondered if you would be interested in buying. Great collection. I have 4 vintage dolls house now, an early 1980s Lundby, A 1/24th scale Toyworks (my childhood dolls house, a blue box house and most of the accessories and have just bought an old Tri-ang 50 :). Hi, I love your collection. I have had it stored in my favourites list for quite some time now and regularly 'dip in' when I need some inspiration. All your houses have a lovely, homely quality. My favourites are the Triangs and the Amersham. You have a fascinating interest. Thank you for sharing it. Fascinating . My grandfather was A. Barrett of Barrett and sons and my father one of the sons. Looking at your Caroline's home was like being 8 again! Actually I think my own was the chalet. Dad saved the more luxurious one for my kids! Dad made all the plastic bits for Bartons from 1970 when they moved across London. Lovely to see all the old things still being loved! Wow. What a collection. I have the Caroline's Home from 1975. I got it as a child and it was taken out of my Mum's attic a couple of years ago for my little girls. I still love it. And enjoy watching my 2 and 4 year old playing with it. I am extremely impressed by your collection. Living in Australia, I am grateful just to own a Tri-ang House, as I love them so much... there is just something about them! 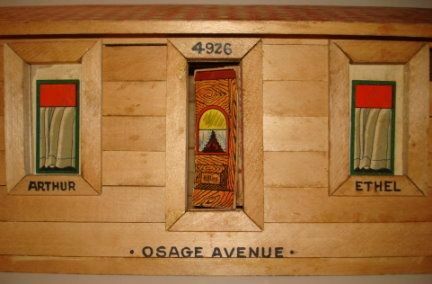 I searched for articles about Tri-ang Houses and photos in Doll House magazines - for years in vain, until Marion Osborne was finally able to identify it for me. Amazingly, It is a no. 75, which is quite rare and was made for only 2 years - 1939/40. I feel so lucky to have found it. Great collection. I am quite envious! Thanks for sharing it. I have several vintage houses that I have tried to restore in a sensitive way, and furnish with vintage pieces. 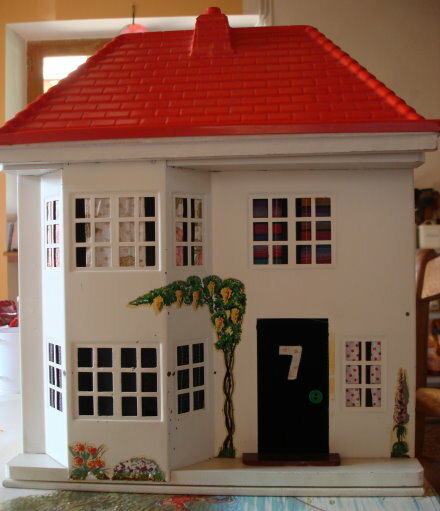 I HAVE A 70 DOLLS HOUSE WHICH IN HAVE HAD SINCE A SMALL CHILD,. 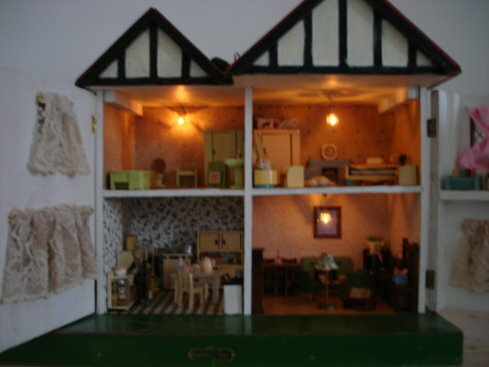 I LOANED IT TO MY NIECES AMD DURING THAT TIME LOST SOME METAL WINDOWS.. COULD ANYONE HELP ME FIND SOME YOUR C1950 I WAS PLAYING WITH MY DOLLS HOUSE IN APPROX 1940 AND IT WAS NOT A NEW ONE . ENJOYED YOUR DISPLAY. I have been given an ultimatum to have it finished by Easter according to my Granddaughter Help. what a fantastic collection! Would love to be able to ask you questions about some of them! Loved looking at them and gave me lots of inspiration and ideas! Very interesting looking at your doll houses. I am looking at getting a Lundby for my daughter and I love the yellow fronted one. other than mine your #70 is the only one that i have been able to find on the internet. Thanks for all the info. i would however really like some pics of the back and attic. Wonderful Triang house, I love them! I am planning to collect a couple of Triang houses, such as 55 and 65. Your collection and hard work has inspire me to get started! 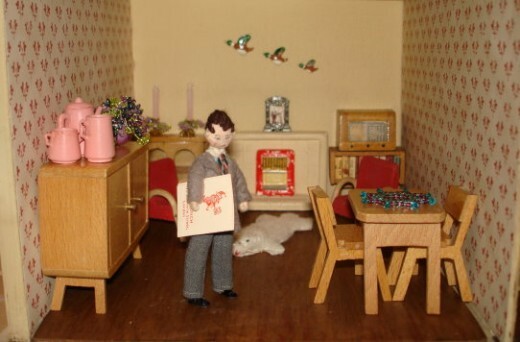 I had to come back and look again at your wonderful dollhouses. Love your Sindy lens as well. Great lens! Love all the photos!! 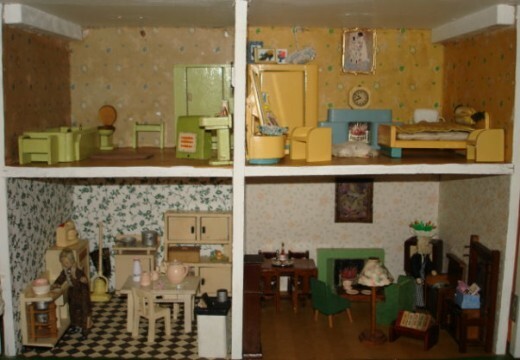 Really enjoyed looking at your Keystone dollhouses. I'm in the process of restoring one that had been painted, wallpapered and carpeted. Some paint of trim covered the edges of walls under the wallpaper, so I've looked at pictures on ebay and your site to see what is underneath. Great collection! Have enjoyed looking at your houses and especially the Amersham one as I have a slightly bigger one but with the same windows plus a name over the door (The Gables) so I imagine that mine is also 1950s. I am filling mine with Kensalcraft stuff. I have 8 triang house; my favourite being The Welsh Cottage. I am trting to fill this with Pit a Pat and so far have amassed 63 pieces and like you obviously look at KT Miniatures a lot! Enjoyed your lens. Very interesting and lots of great photos. Sounds like you do what we do except in miniature! Thanks for a refreshing break from a busy afternoon. Very impressive lens! I remember some of these from my childhood in the 60s! Blessed by a SquidAngel. Really enjoyed looking at your houses and have picked up some good ideas particularly the idea of putting a room in the door. This is definitely the most helpful and comprehensive website I have found. 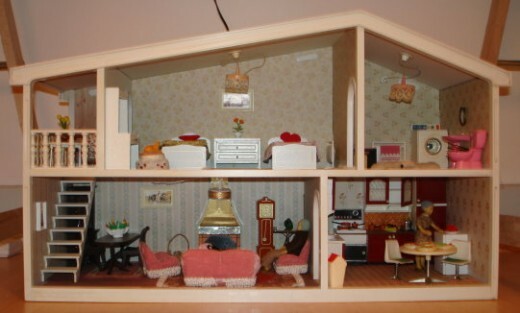 I am such a beginner so thankyou for putting on your informative pictures and explaining your work... Where would I go to get an old dolls house identified? I have just brought something rather Triang looking (but I don't think it is a Triang house, but it is old). It is thanks to your website Im now trying to save the old wall papper that I have discovered hiding behind the woodchip! Wow! Wonderful and informative. What a good job you've done! Just found your site because I typed MY name into Google. I'm the one who christened the "Stockbroker" What an amazing collection of furniture you have, takes one right back to the 4os &amp; 50s. I am just about to restore the huge 1960 Triang bungalow - not many about as fragile. This one has been out of commission for 40 years! I have found your lovely site and have only had a quick look so far. This is just a little note about the Stockholm chimney. I bought my Lundby De Luxe [as it was then] new before Christmas 1979, for my five-year-old, and remember that the chimney came loose with the house, just with the usual sticky patch. I still have the house which started my hobby. Best regards, Joy. Very useful and well laid out. I recognised a lot of items from when I was little - just have 1 teapot now from triang 60! I think this is just about the most informative doll house page I have ever seen. Outstanding. Thank you for sharing your wonderful hobby. 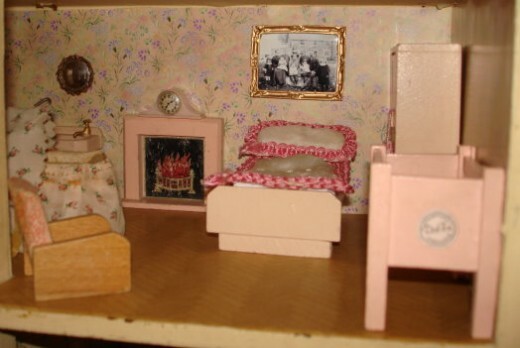 I love looking at your vintage dolls house pics. They take me back in time with all the old furnishings and bits and piecexs and also give me so much inspiration for working on my old 70's 1/24th scale little wooden house. 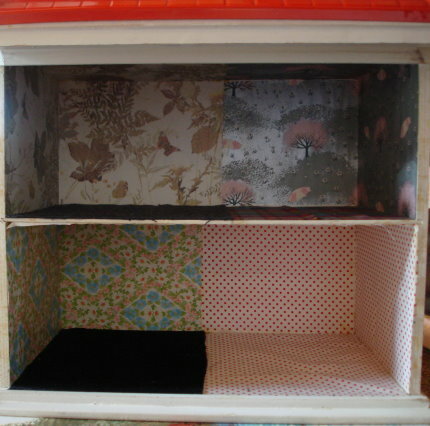 I have two large Sindy and Barbie houses crammed with furniture and now started on the tiny scale as well and love it. I've got a dolls house Emporium 1/12th scale house waiting to be built that was a present years ago and that is going to be my next project when i have completed the little 70's house. I can't make my mind up if to go the traditional victorian/edwardian theme with it or be totally different to the regular and go eclectic and retro 50's - present day with it as probably feel restricted with the victorian/edwardian theme. Again i never tire of looking at your pics and its great how you restore/refurb them and your love and passion for them shows through. Great web page you have done wonders with these houses. All your little added touches make them all look very homely. I have just purshased my first Triang no 62 house and can't wait to furnish it. I have been bidding on ebay for original vintage items but only going for the 1/12th scale so thanks for the tip about Bartons furniture I will now look at these items too. Thanks for all the links too as I am just starting out on this project, these will be very helpful. Many thanks for sharing your houses with us it has been really interesting and lovely looking at them. I have a couple of more houses to add and the Tri-ang 40 has been restored and now has the Twigg furniture on display and the Conway Valley has some Barton small scale furniture - so I am hoping to update this soon ! 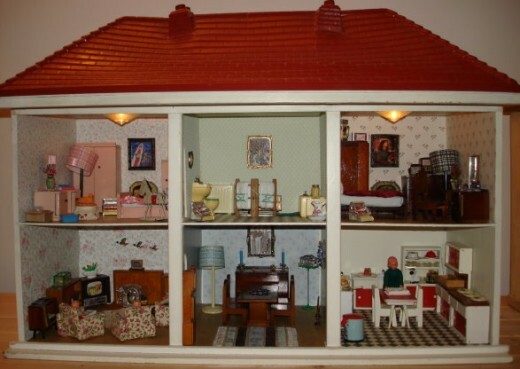 I restore dolls houses of all ages but I mainly restore Lines and Triang. I have now restored nearly 10 Triang wallpapers to original colour and pattern and I hope to start reprinting these soon. I have also reproduced the original roof paper and shutters. If you have any pieces of original paper I would be happy to see what I can do. I have a tudor type house that i thought was a tri-ang but the windows look like GeeBee but i can't find any info or pictures to be able to check. Hello Sarah, I love your houses - and reading about the work you've done on them. I especially like the Dol-toi furniture in the bedroom of your Amersham - I had never seen those pieces before. You have a terrific collection. 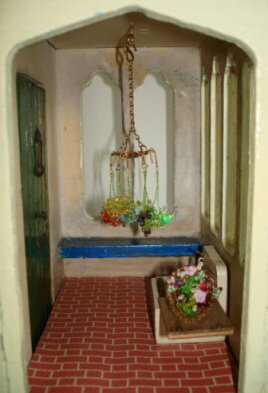 I've just started a blog about my dolls houses at http://rebeccascollections.blogspot.com/ - inspired by your descriptions &amp; Anna-Maria's blog, which I discovered through your site - funny, when we are both in Australia! Hi, lovely houses, i have two Amershams, pictures are on my web diary http://robertafairs2006.spaces.live.com. there is also an early Lines house? We aren't sure but Marel things it looks like one, it's nice anyway. The doll in the Conway house is an Airfix doll, i think she is called Anne. Thank you so much for letting me visit your lovely houses. I love my old houses and have an eclectic mix of very old some Lines and Tri-ang in various states of decomposition. All are works in progress as almost all were empty when I bought them. Furnishing them will take a long time but it's a joyous quest which keeps me sane. It's good to meet fellow addicts as my family are mostly tolerant but often sigh as I'm distracted by what they consider bits of old tat but to me is a vital bit which compliments the jigsaw which is my collection. I'm put to shame by your clean,neat contents and your careful descriptions! I'm very disorganised and untidy as mutual friends will tell you-and an IT crash demon whose photography leaves a lot to be desired. However,your good example has given me something to aspire to- and I promise I will try to take some decent photos and send them to you. Hi Ali - i'm glad i've inspired you ! I think the metal label on the back means that it may be pre WWII because mine is 1950s and it has a paper label. What colours are the window frames and does it have its original wallpaper ? What sort of patterns is it ? I believe the No 62 was introduced around 1931 and production continued into the 1950s so it can be tricky to date these houses, but windows and wallpaper can help narrow it down. According to Marion Osborne's Tri-ang book, the round metal label was in use in 1935. Hope this helps &amp; good luck !! I am so impressed with your collection, they are truly lovely houses. Its amazing, that considering it is not the original furniture, my Triang 65 has been furnished with a virtually identical choice as yours! Hi Alison, thanks for your comments. When I was researching other Amershams I could only find 3 other pictures of houses on the web. Not a lot is known about the firm, which produced houses from the 1930s to the 1950s - although over 3 decades there doesn't seem to be many houses left ! I just love to look at your Triang houses. Doltoi and Barton as well. also many thanks for you nice words about my website! 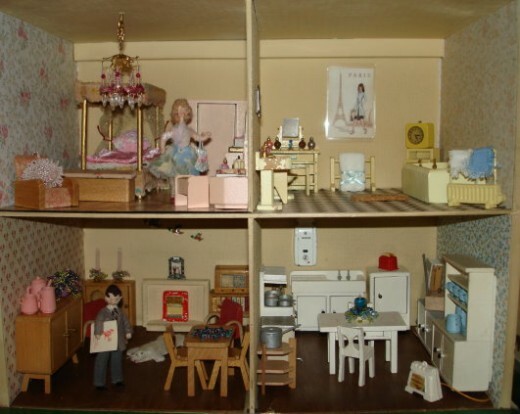 loved looking at your doll's house collection. My husband has just bought me a Tri-ang house that looks like your 1930s house, except it has a garage with a room above to the left of the main house. It has 'amoebic' wallpaper and imitation woodblock floors. How can I find out what model number and how old it is, the metal plate on the back doesn't say. Also more importantly how do I find out the scale. I bought some new 1/12th on ebay, but it doesn't look quite right. Now I've seen your wonderful pages I will forgive you for pipping me at the post on a Jenny's Home on Ebay last week! You've done very well with your repairs and reconstructions - I've had about thirty Triangs through my hands (and an Amersham, a couple of Caroline's Homes and a couple of IDKs) and I know how hard it is. Currently I only have 5, plus one room of a Jenny's Home - so I will bid higher next time. I will look back in here to see how you are doing! Brilliant! Thank you, this is all so useful, interesting and inspiring to a novice like myself . I've really enjoyed looking at your houses - truly inspirational. The old painted Dol Toi furniture is lovely, and your finishing touches are very imaginative. I do envy you the space you have to keep them - I have three little old Tri- angs and an old Lines house, and would dearly love to expand my collection. Trouble is, I can't bear to sell any to make space....I too yearn to get a big stockboker house....but it could end in divorce......! Wow, your collection looks ace Sarah. You've set up each house so thoughtfully. Well done!